If you have a student who enjoys doodling, don’t view it as a waste of time. Doodling is a gateway to developing fine motor skills. While letter formation is an important part of handwriting, letters won’t happen until the child develops hand muscle strength, precision, and endurance. Some children might enjoy writing endless strings of letters to build up hand strength, but if you have a creative little person they will most likely balk at such a waste of time. Many adults enjoy a meditative type of doodling called Zentangle. If you search for “zentangle patterns” on the internet, many of the patterns will be too complicated for children. However, there are plenty of patterns that kids can learn and enjoy. I have enjoyed a book called One Zentangle a Day. As I worked through the book, I taught my kids patterns I thought they would like, and made a notebook of favorite patterns for future reference. Some of our favorite patterns for kids. Start with a small square of paper. 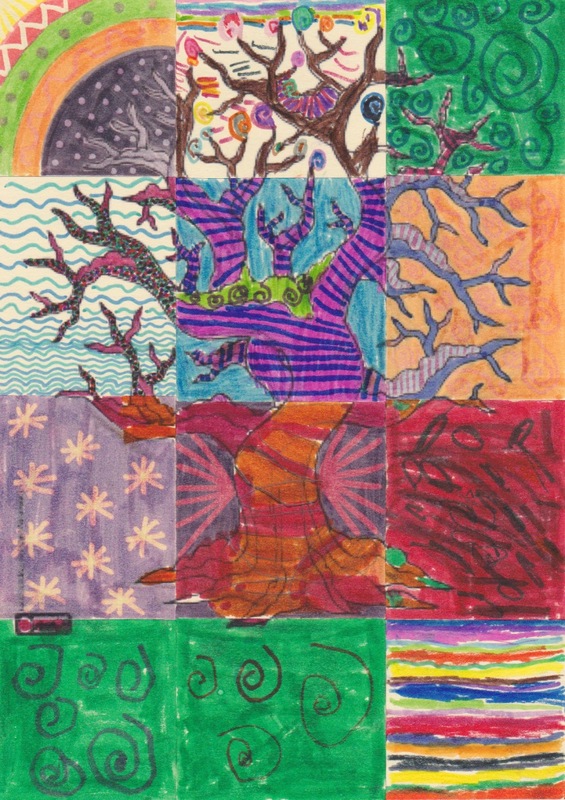 Zentangle uses 3.5″x3.5″. Personally, I cut cardstock into trading-card sized pieces so that I can store them in trading-card albums. (Some doodlers prefer a larger piece of paper, but the small size is less intimidating.) Use a pencil to draw a shape on the paper. Fill it in with doodles and patterns. The best pen to use is a black Micron pen, size 01. However, we often resort to fine Sharpie pens as well, or any other fine tip marker. See some of our Doodles here. For very little ones, it might be easier to start with a pre-drawn template (print on cardstock and cut into 2.5 x 3.5in rectangles). Many graphic designers use zentangle-like patterns in their work. We often find an artist we like and copy their ideas.